Aarohi December 18, 2018 FICTION, Procrastinating Tuesdays! Hey guys! So later this week, I’m going for a…. (wait for it)….vacation! It’s only for a week or two, nothing special, but my cousins from The States are coming home! So for this weeks Procrastinating Tuesdays post, I’m going to share with you my packing routine. Finding a suitable suitcase (or a backpack for short journeys). 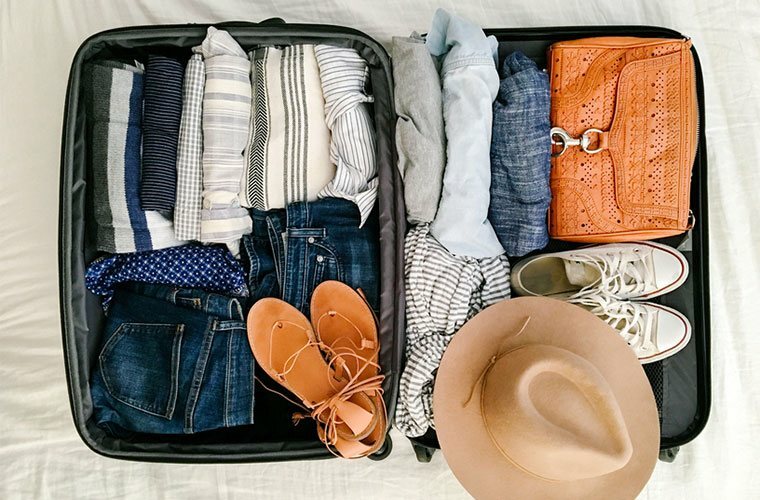 Packing the essentials (basically clothes and footwear you’re going to wear everyday). Packing things you might need. So this stage is, arguably, the hardest for girls, because most of the time we don’t know how much we’re going to pack and most of the times, we end up packing way more than we actually need (not to mention the fact that we also end up wearing our friend’s clothes). Now, if you’re at this stage and you’re stuck, just use the suitcase you usually carry. In some cases, though, these might not be enough. So just make a mental list of all the things you’re going to carry and accordingly take a small backpack or another suitcase. That was pretty east right? Lets move along. As I mentioned earlier, ‘essentials’ are basically clothes and footwear you’ll be needing throughout your trip. Now, this stage is important and you need a plan. Before you actually start packing, be sure to check out the weather of the place you’re visiting. Is it cold? Know immediately that you’ll be needing warm jackets and thermals. Is it hot? Look for your sunglasses, shorts and crop tops. Now that you know what type of clothes you’ll be needing, it’s time to get into the details. Plan out a mental itinerary. Is there a party? Get a few cute dresses. Is there a family dinner? A pair of jeans and a cute top should do. Is there a formal dinner? I’m thinking skirt or dress (whatever you prefer). Coming to the footwear. All you need to know is that heels go with dresses and skirts. Sneakers, superstars and sketchers go with dresses, jeans and shorts (basically everything) and flats go with everything but dresses and skirts. Stick with that and you’ll be fine. For most of us, this stage is just a ‘maybe’. Since I never come across it, I don’t really have anything to say. It’s only meant for those ‘over the top’ girls (no judging though). Just one thing- ask your mom. She gives the best advice. This is no big deal. My best advice is to pack your makeup and accessories along with your clothes. First, just pack your everyday makeup. Then according to the occasion, pack the extra thing you might need. If you don’t usually use eyeliner and mascara but might need it, take that. This is just an example, it all depends on what makeup you wear. The same goes for accessories. Just remember that long and short earrings are worn for different occasions. Short ones like studs are for family gatherings and longer ones are for parties. I hope I don’t need to elaborate this stage because everyone goes through it and everyone knows what to do. This really depends on your needs. Medicines are a must. Make a first aid box. It might seem silly, but it always comes handy. Pack all medicines you need in case of emergencies and for allergic reactions. So that’s all for this week! I hope your packing is a little more organised than before. If you have any queries or think I missed something, feel free to comment and tell me.